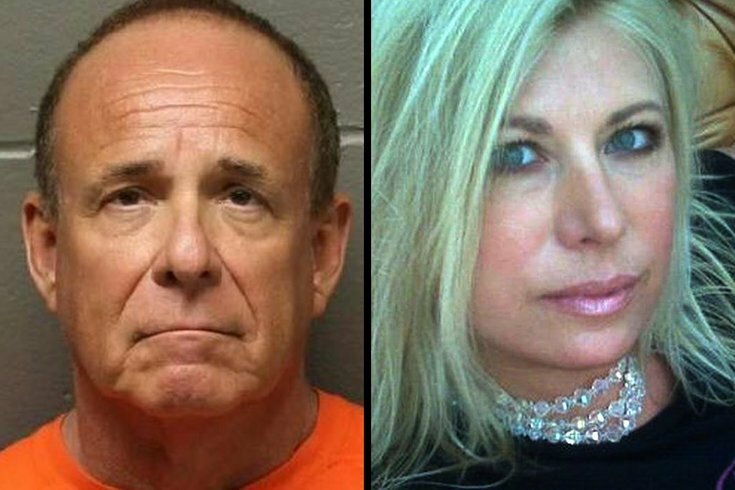 A South Jersey physician has been charged with murder five-and-a-half years after his wife, Linwood talk-show host April Kauffman, was found shot to death in their home. Atlantic County Prosecutor Damon G. Tyner said on Tuesday that Dr. James Kauffman, 68, was afraid his wife would go to authorities about a drug enterprise he was allegedly helping to operate with members of the Pagan's Motorcycle Club, an outlaw bike gang. So he hired a hitman to kill her, the prosecutor alleged. Kauffman also faces conspiracy charges related to the murder as well as racketeering charges tied to the alleged drug scheme. Authorities allege Kauffman headed the drug enterprise with Ferdinand Augello, a 61-year-old Petersburg man, who also faces murder, conspiracy and racketeering charges. Kauffman has since remained in Atlantic County jail and was indicted in September in connection with the June standoff. An endocrinologist, Kauffman allegedly gave free oxycodone scripts to at least two people sent by Augello, Tyner said. In turn, those individuals then recruited additional people to take the scripts and either resell or use them. Augello would receive either $1,000 cash per script or a predetermined number of pills once the script was filled, the prosecutor's office said in a lengthy press release. Kauffman and Augello knew each other prior to 2011, and the scheme carried on until authorities searched Kauffman's office and residences in June 2017, authorities said. When authorities turned up at Kauffman's Egg Harbor Township office on June 13, he greeted officers there while holding a 9-mm Ruger handgun and then pointed the gun at himself, officials said at the time. Authorities brought in a hostage negotiator and ultimately brought Kauffman into custody on weapons charges. Three other people – Joseph Mulholland, 52, of the Villas in Cape May County; Beverly Augello, 47, of Summerland Key, Florida; and Glen Seeler, 37, of Sanford, North Carolina – also face first-degree racketeering charges for their alleged roles in the scheme. Three other – Paul Pagano, 61, of Egg Harbor Township; Tabitha Chapman, 35, of Absecon; and Cheryl Pizza, 36, of Murrells Inlet, South Carolina – were each charged with second-degree racketeering. James Kauffman "solicited" Augello in the summer of 2011 to kill his wife after she threatened to expose her husband's alliance with the Pagans when he objected to a divorce settlement, prosecutors allege. "Ferdinand Augello propositioned a number of individuals to murder April Kauffman," the prosecutor's statement read. "These individuals were all Pagans, former Pagans or associated with the Pagans. He was unsuccessful for almost a year and James Kauffman was getting restless when Ferdinand Augello found Francis Mulholland." Prosecutors believe Mulholland, who is cousins with alleged Pagan associate and enterprise member Joseph Mulholland, was given a gun and a ride to the Kauffman home in the early morning hours of May 10, 2012. Mulholland then went inside the home, which had been left open for him, and allegedly shot April Kauffman twice, killing her, Tyner alleged. Linwood police later received a 911 call from the home around 11:30 a.m. and were met there by James Kauffman, who allegedly told them he had found his wife dead inside the master bedroom on the second floor. She was found unconscious and lying face down on the floor, authorities said. Authorities believe both Francis and Joseph Mulholland were paid for their roles, but how much and whether payment was made in cash, drugs or both is not known. Francis Mulholland died of a drug overdose in October 2013, Tyner said. The Atlantic County Prosecutor’s Office, the Cape May County Prosecutor's Office, the FBI and the Linwood, Egg Harbor Township, Somers Point and Lower Township police departments all collaborated on the investigation.